Aromatics Elixir by Clinique is a chypre-floral fragrance for women. A classic scent from the House of Clinique, in fact one of the very first scents they launched. Aromatics Elixir is seductive, powerful, serene and confident; it’s for the women who don’t follow trends, for the ones who don’t mind leaving an imprint, the woman who knows her own worth. An opening of bitter green herbs blends into the heart of sweet floral notes of geranium, rose and white flowers. Chamomile acts as a link that holds the scent together while the base of oak moss and patchouli ensure you have a truly magnificent scent. 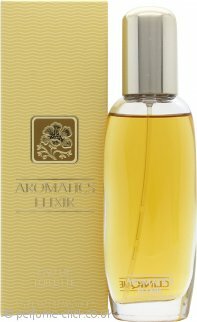 Aromatics Elixir was launched in 1971. Clinique Aromatics Elixir Eau De Toilette 45ml SprayBest perfume ever.